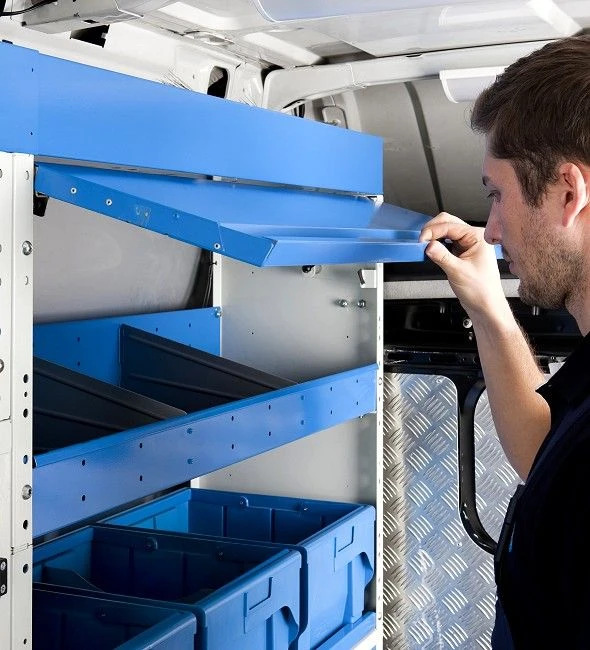 The shelves have a trapezoidal form with the front end lowered giving you greater access and with the rear end raised preventing the items and tools stored from falling on the floor. 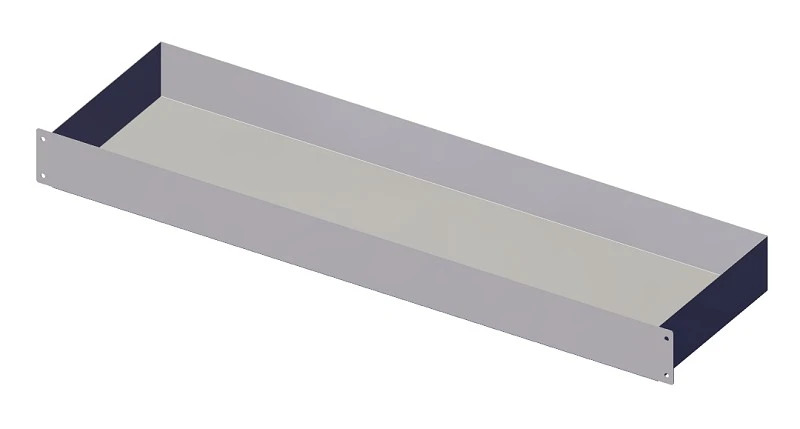 The oil resistant rubber mat is provided as standard.To reduce overall weight the dividers are aluminium. 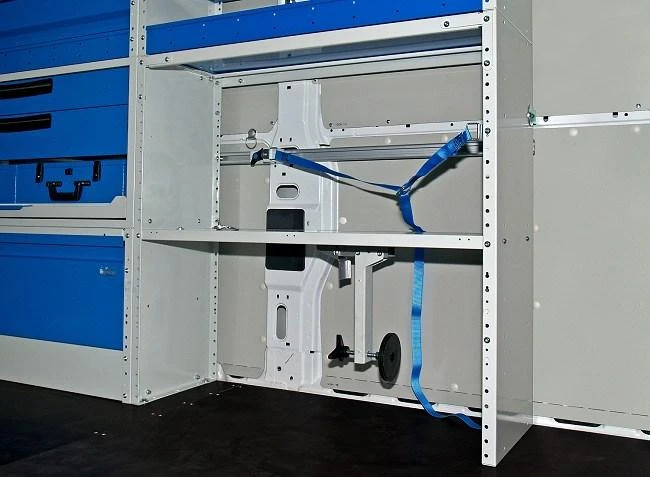 Thanks to the “VIBRASTOP” system which consists of plastic inserts that isolate the dividers from the unit, all vibrations are eliminated reducing noise. The number of dividers which can be mounted varies from 1 to 12 depending on the length of the unit. Normally we supply 1 to 6 dividers. Overlapping shelves with sides of various heights. Top shelves.These shelves are used as the last top element.They have the same section as the overlapping shelves however the side panels are different. They are lower and have a trapezoidal form. 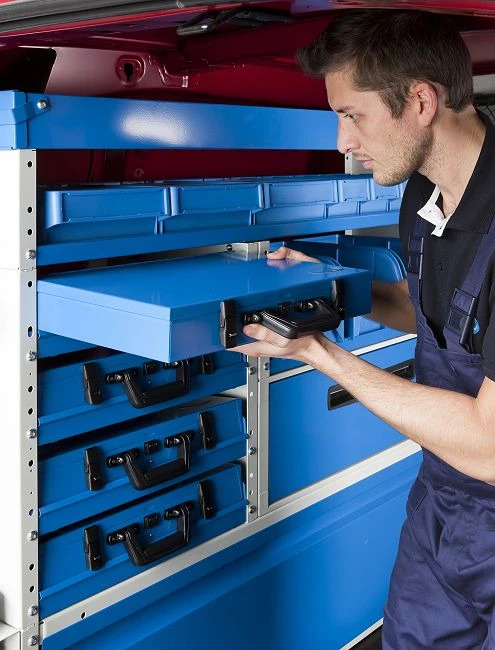 Many shelves units are available with doors.The up and over door not only prevents the tools and hardware items stowed from falling on the floor, but avoids prying eyes. 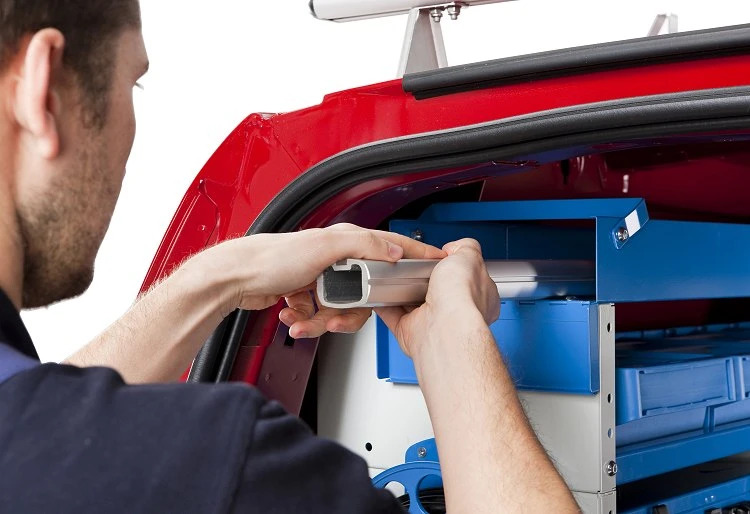 These doors can be fitted successively to the actual van upfit. Article SA20/2435, version with door art. ST20/2435. In the picture you can see in detail our advanced door hinge system. 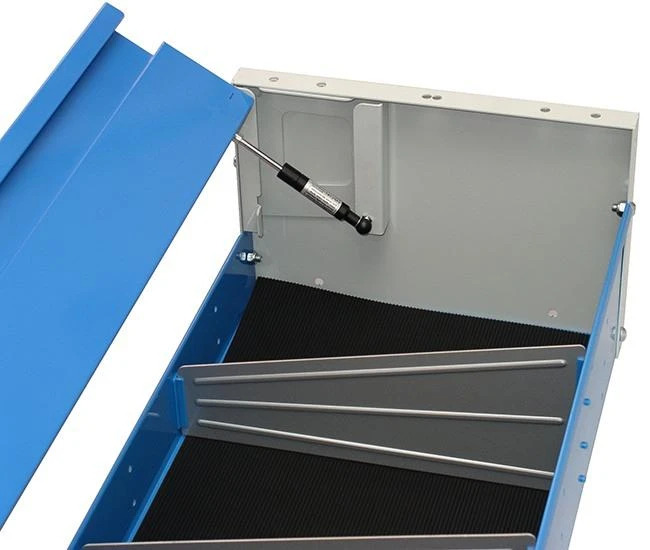 Top trays are top elements with an end door.They are available in lengths from 1.014 mm up to 4.056 mm.They are supplied without rubber matting and dividers.Ideal for stowing pipes, raceways and other long items. 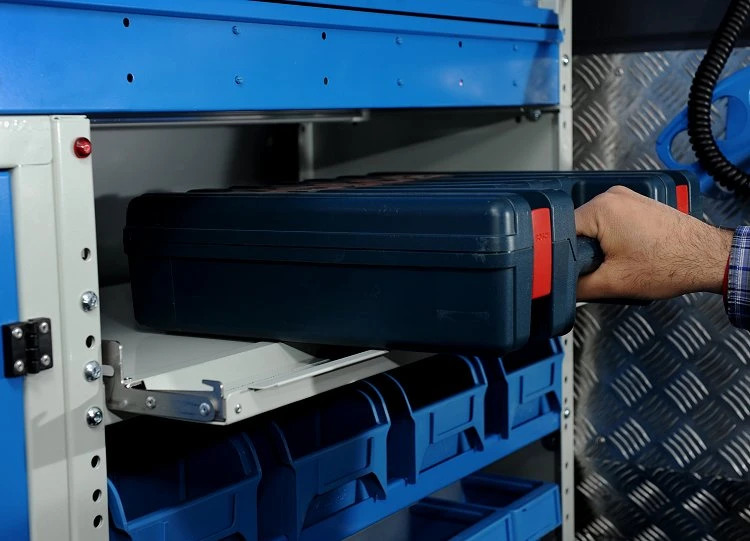 Syncro System has always offered their clients a wide range of solutions for transporting utility and tool cases used by electricians, plumbers, businesses, workers on construction sites or handymen working in homes or offices. The forward-slanting shelves have side blocking mechanisms that are easily adjusted to accommodate the size of the case. 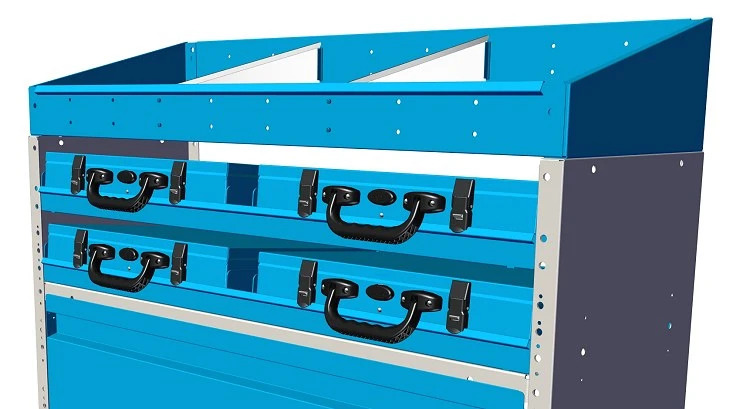 It is possible to store Syncro System portable utility cases or any other kind of plastic, metal or aluminum carrying case. It couldn't be easier to use: slide the case into position on the shelf and … you're done! There are also straps available for added security. 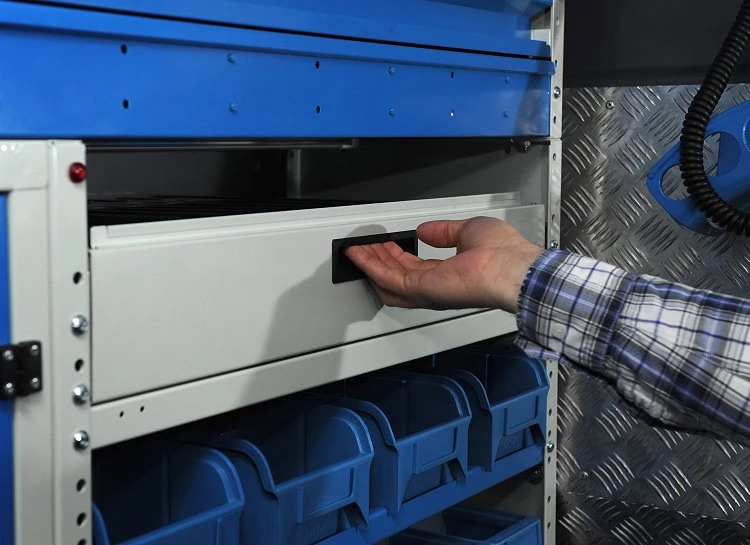 A new line of Syncro System shelves allow the easy storage and transport of bulkier materials, boxes, tool boxes, cases, and much more. 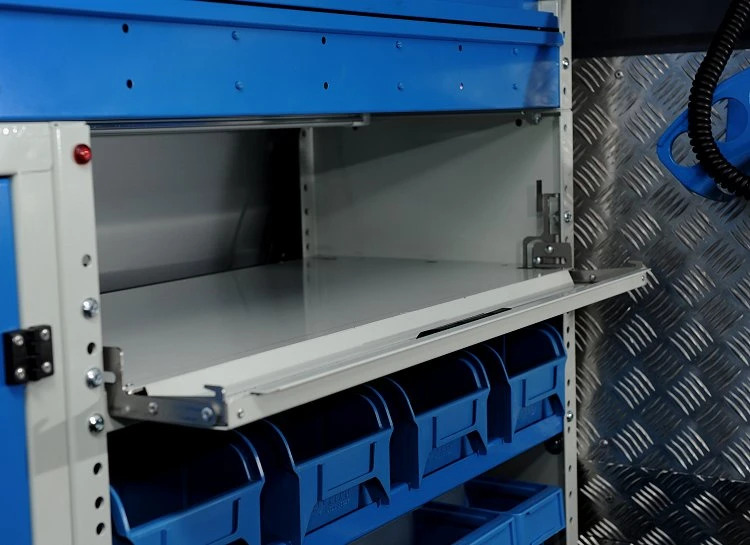 Each shelf can be positioned at varying heights and can be installed with either forward-tilting or fixed-position base board and a hinged door that opens vertically. 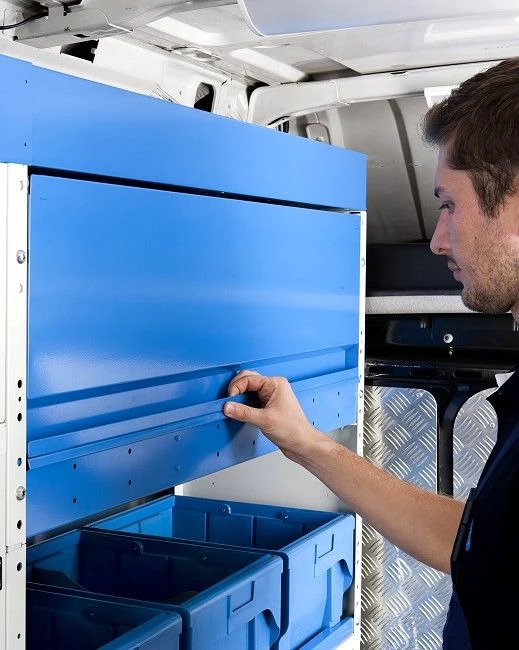 It's fast and practical and a great help in organizing your upfitted van. One of the problems that van users often find is that liquids like oils, fuels or detergents get spilled during work or travel. Cleaning up can be difficult and time-consuming, without mentioning possible damage to materials and equipment or impact on the environment. 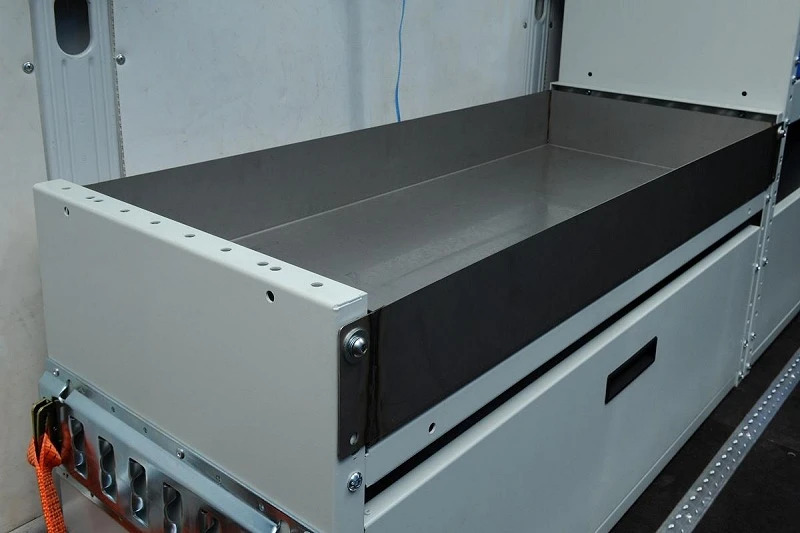 On top of this, the transport of hazardous or polluting liquids is strictly regulated and legislation imposes the use of special trays to carry cans containing them. 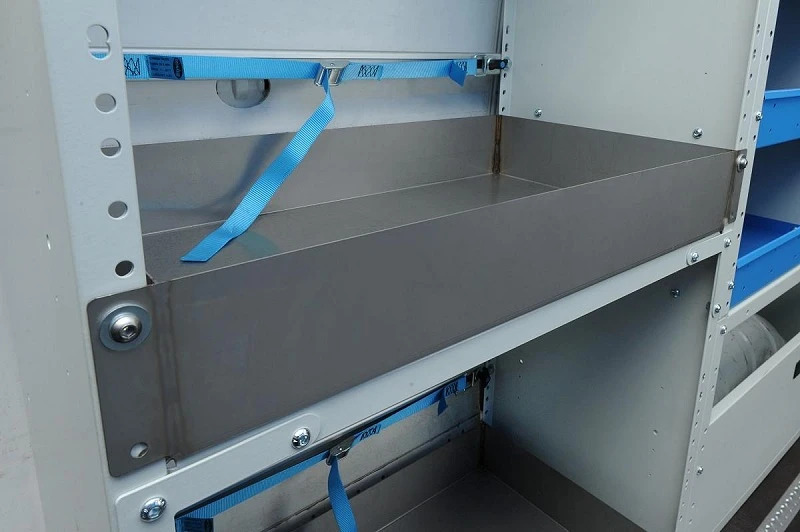 To solve these problems, Syncro System has just introduced new leakproof trays, made from stainless steel and available in a range of sizes. 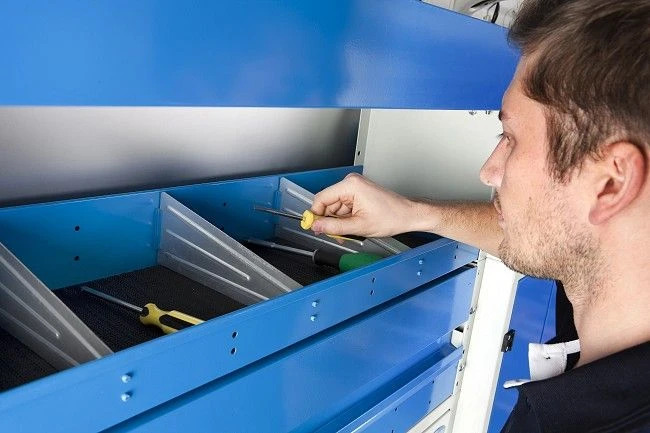 The trays are installed simply by fixing the two front tabs in place with screws or knobs. 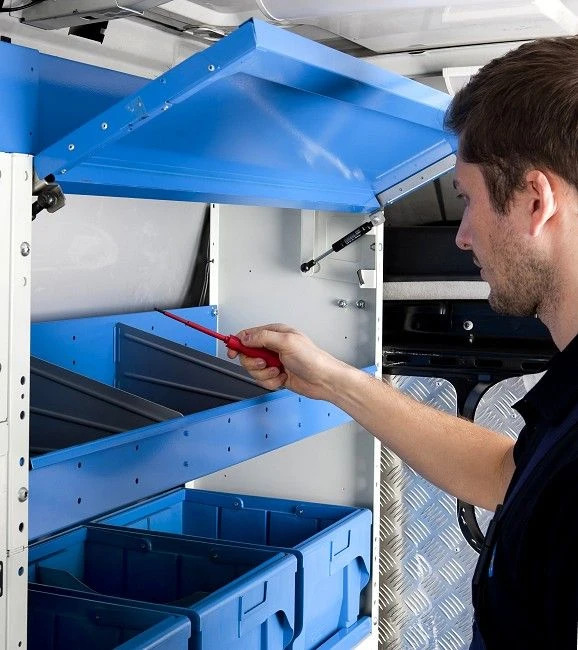 The trays are therefore easy to remove and empty whenever necessary. 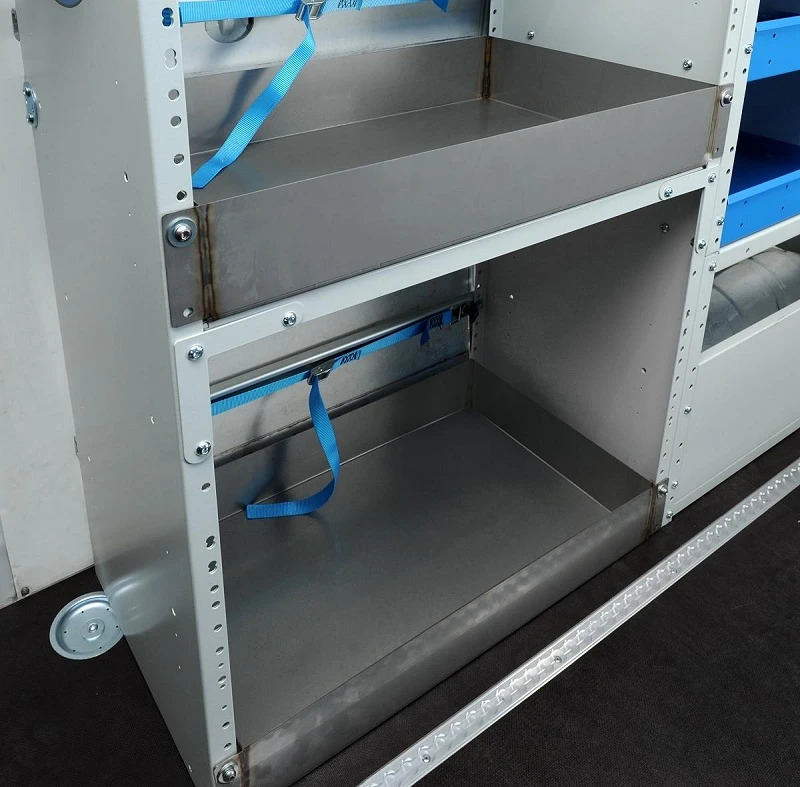 Liquid containers can be retained in the tray by straps or any other of the solutions available in the Syncro catalogue. A simple but effective solution to a problem that can have even serious consequences!